I’m all about seasonal decorating but at the same time, I like to make sure that decor items I purchase now will flow seamlessly from one season to the next, especially if I’m updating or making changes late in the season! So today I’ll be sharing with you some late summer decor ideas that will absolutely take you straight into this fall. This post was sponsored by The Home Depot but as always all opinions are 100% my own. Please read my full disclosure policy here. After the light, bright, airiness of spring and summer I’m always so ready to add a strong pop of color and texture by this time of the season, but without being too fallish since fall is still such a long way off at this point. Subsequently, I always find the best way to do this is through the use of pillows and accessories. They are for the most part affordable, items you can switch out easily, and usually always serve a purpose in your space. 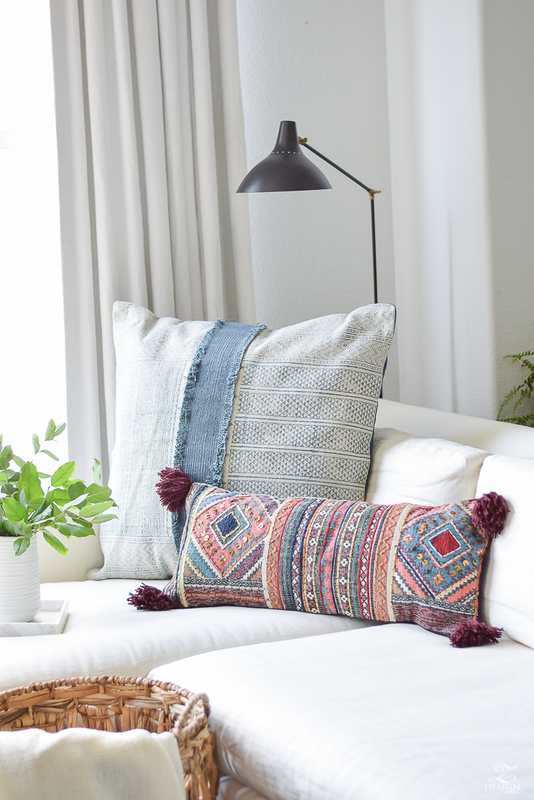 Starting with some fun pillows that will flow perfectly from summer to fall, I was so excited to find these fun, boho chic pillows from The Home Depot. I mean I honesty didn’t even know there was such a softer side to The Home Depot and that they carry so many great home decor items! 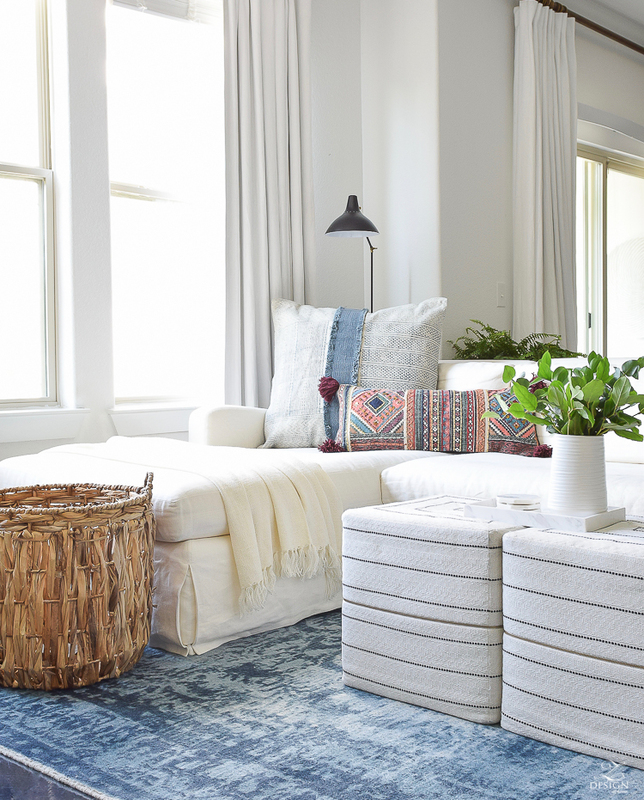 We’ve all been into the store before (or sent our husbands in for something) and I knew they had rugs and a few other fun things that I might decorate with (and of course I always shop there for my indoor and outdoor plants) but I had no clue they have such a great and vast selection of home decor, did you?! Some other fun things I recently learned about The Home Depot is that they carry some of my favorite brands in home decor that I’ve always shopped for, they have free shipping, and they have all of the current styles that I’m always looking for to decorate my home with! 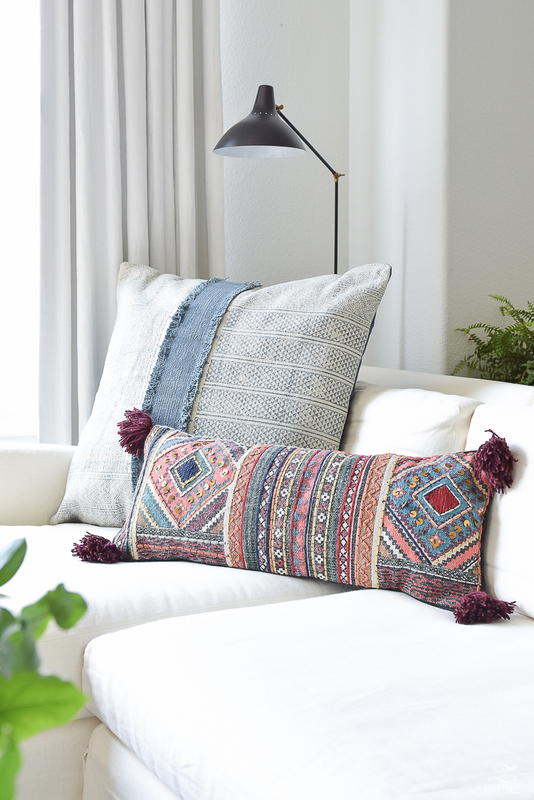 I love the pattern and fun fringe on this large pillow (that can double as a floor pillow) and the tassels on this patterned, globally inspired XL lumbar pillow. Both of these add just the right amount of color and texture to update my space for late summer but will also carry me straight into fall this year! Adding a textured vase like this one with simple greenery or flowers can also update your space for late summer/early fall! 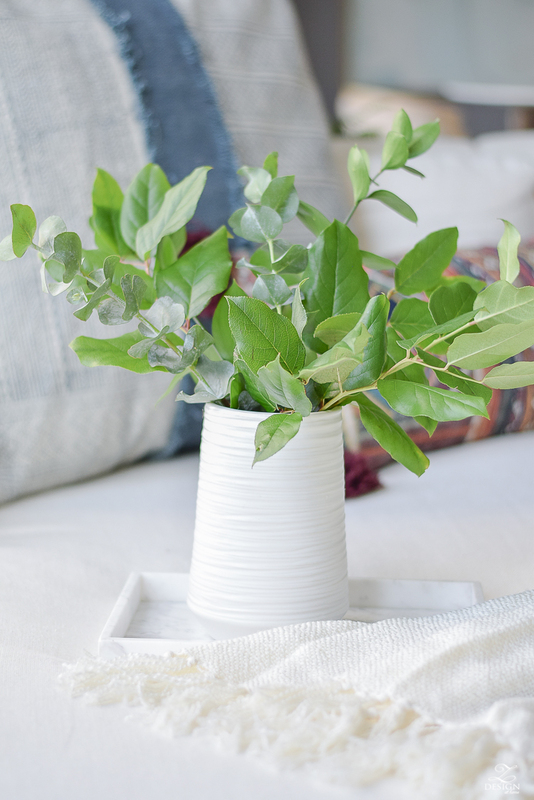 lately I’m really into just using simple greenery and this textured vase brings a pop of personality into my space for summer but will also be beautiful with some fall flowers in it in just a few short months. When this vase arrived from The Home Depot it was perfectly wrapped for shipping and arrived at my door within just a couple of days. Greenery like this from your local grocery store is great for late summer because it’s low maintenance and will last for weeks, unlike most fresh flowers. One of the best ways also to update and add texture and interest into your space for late summer/early fall is to bring in a new, fun basket. 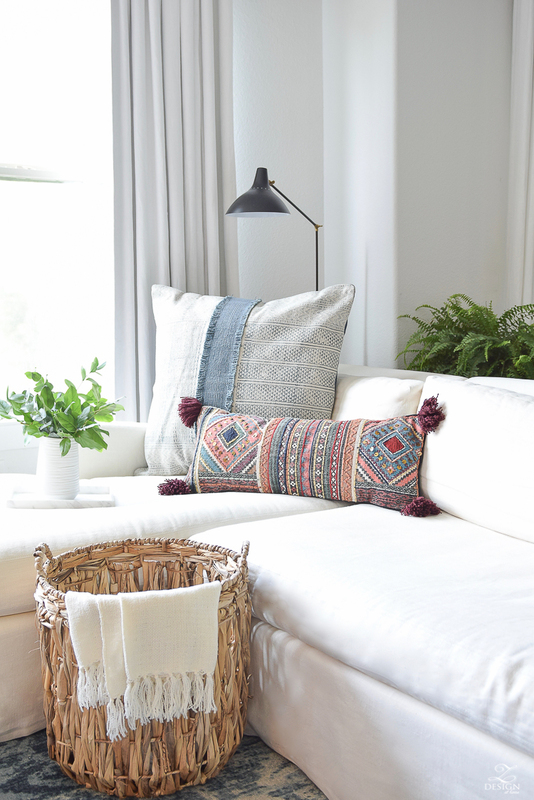 Baskets are great for pillows, throws, storage and plants. I really love this one since it’s made out of banana leaf. The texture is incredible and it looks so pretty with this textured blue, tassel throw billowing out of it. 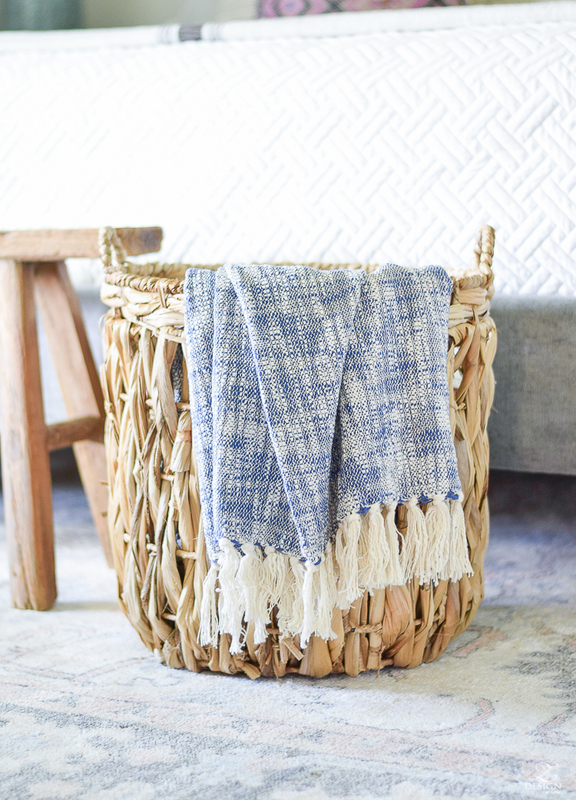 This throw is lightweight and will flow right into my fall decor with it’s great texture and pop of blue. I also got this simple, versatile, lightweight throw in cream from The Home Depot. 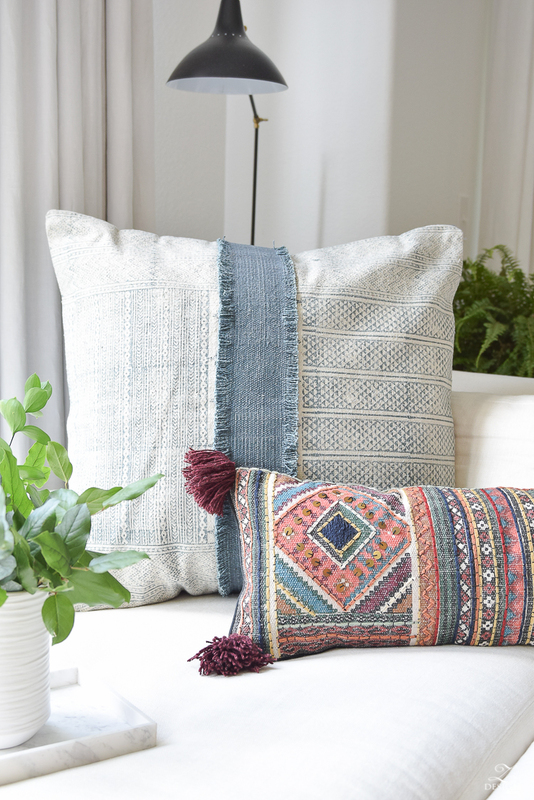 It’s perfect to throw over the edge of our chaise or to cover up with while watching those late summer night movies. 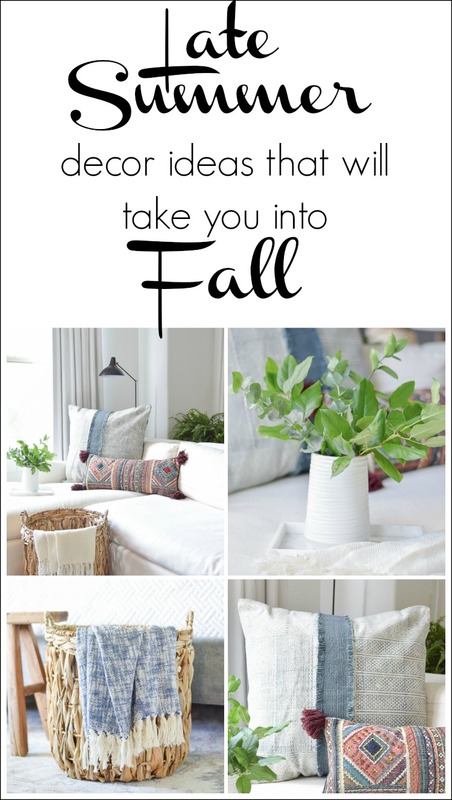 It will also flow seamlessly into my early fall decor, or any time of year! 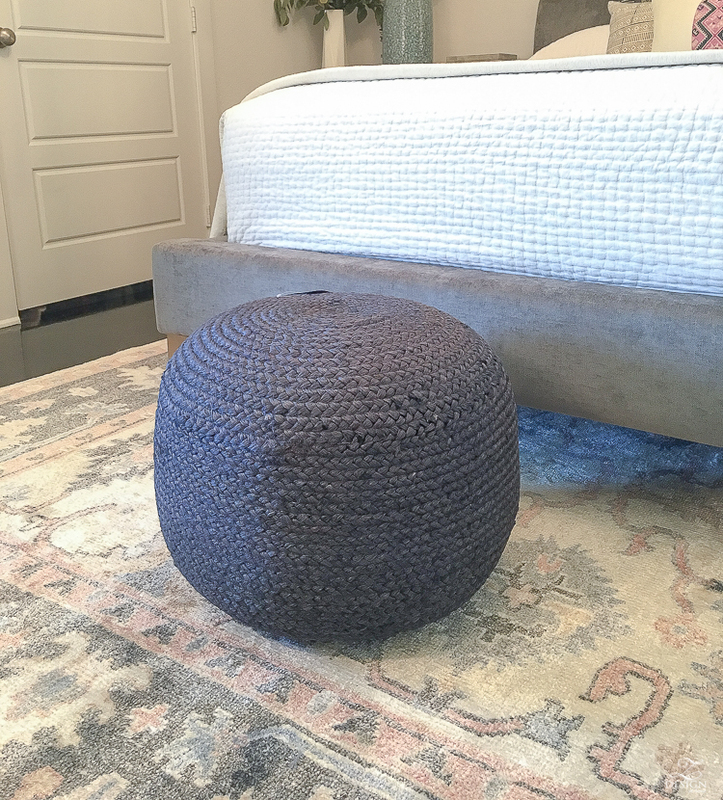 Lastly, I was so excited to see they have my navy blue, jute pouf in stock! I used this in my recent One Room Challenge space and have had a hard time finding it in stock again for you all so here it is if you’ve been looking for it. It also comes in 3 other colors. Seriously friends, my favorite thing about this job is sharing with you great finds and great retailers that carry and sell those finds so I hope you will pop over to The Home Depot to check out their selection of home decor very soon. They are now one of my favorite destinations for shopping a wide variety of furniture and home decor and I know you will be as pleasantly surprised as I have been. Below, make sure to check out some of my other favorite finds from The Home Depot as well and thanks for stopping into the blog today! I love your home – everything looks so bright and stylish. I love the details that you have added, great ideas.